INTRADIA is a part of P1P2SOLUTIONS which is dedicated towards liberating solutions ( Ideas). As an successful ambitious organisation with clear goals and objective, your team is one of the best talent group in the category. They collectively have a huge experience and most likely their potential has not been fully exploited. 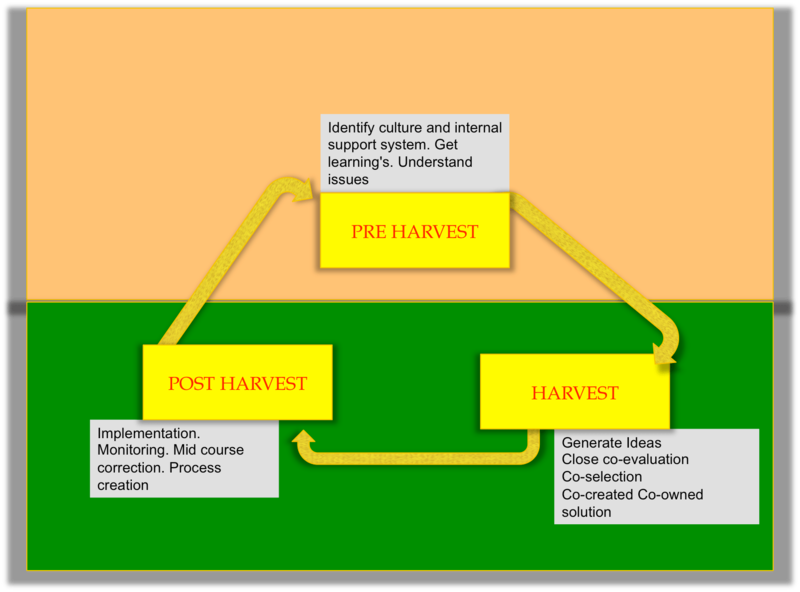 Its seen that an EXTERNAL FACILITATOR is able to draw out and efficiently HARVEST the CROP OF IDEAS with. the internal team. INTRADIA HARVEST process is based on few beliefs. BELIEF 1: THE QUESTION ASKED DEFINES THE ANSWER YOU GET. The question asked defines the answer you get. hence it is imperative for the organisations to maximise returns must direct their efforts towards correctly defining, constructing and prioritising the opportunities / threats/ challenges or issues at Hand. BELIEF II: IDEAS BURIED WITHIN THE SYSTEM NEED TO BE LIBERATED. In spite of the talented experienced team within the organisation, it is the external facilitator who is able to leverage and effectively harness collective ideas / solutions in an unbiased way and further shape them toward implementation. 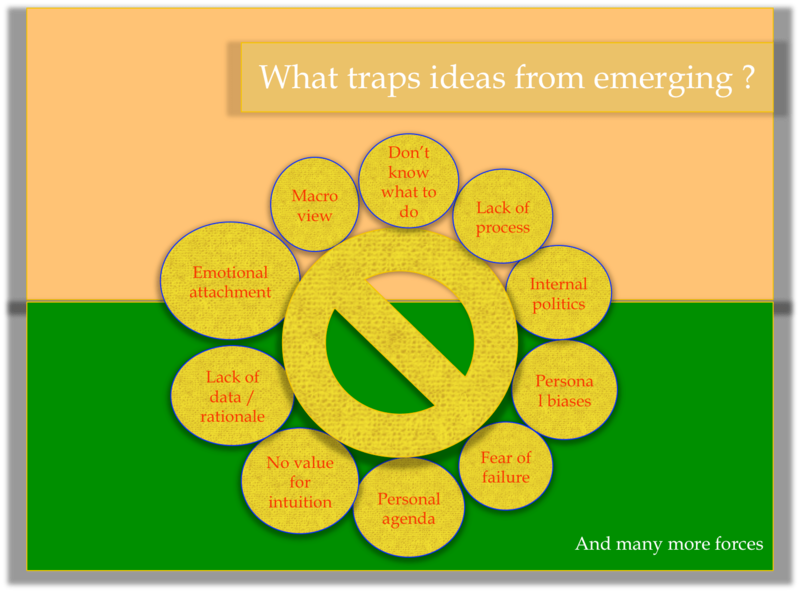 There may be many reasons that prevent an IDEA trapped / buried within the team to surface. For example the idea owner employee may be worried that his idea may boomerang at him as an additional team, he may think that suggesting idea would be trespassing his authority, accountability and responsibility. Or he fears that the Idea failure will badly reflect on him. BELIF III: QUANTITY MEANS QUALITY. Though this may seem illogical it is the fact that when you have seen the issue / problem/ opportunity /challenge from every possible angle, in process collectively developing multiple solutions – there are more chances for organisation not falling in the MOST OBVIOUS, TACTICAL, KNEE JERK reactions. When a lot many Ideas are considered and evaluated the with a clear end objective the most sound solution is bound to emerge. INTRADIA brings in a host of new practices and process to IDEA HARVEST the solutions from your internal teams. 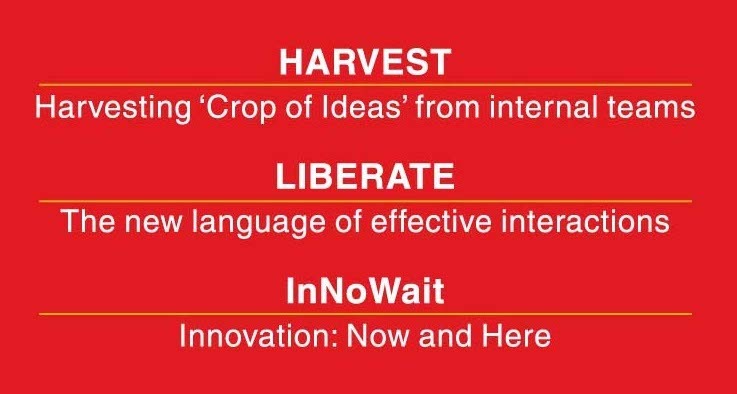 We use IDEA KA ANNAR- and LIBERATE processes for ensuring stakeholder participation and development of solutions. Thus the ideas developed are CO-EVALUATED, CO-CREATED and in process CO-OWNED making then that more acceptable and increasing possibility of complete internal support and end success. ROLE OF INTRADIA is to act like a good facilitator. It works with a strong believe that the internal teams with huge collective experience are better placed to provide a solution. It also believe that the teams need to be trained in such a manner that they are able to HARVEST THE CTOP OF IDEAS independently the next time round. Taking an analogy of SCULPTING as a process. The idea is buried within a block of stone. Your internal team is the sculptor which knows the final form of the IDEA ( Statue) that is buried in side. Its the team which ends up removing unwarranted pieces of rock to make the statue ( idea ) emerge. INTRADIA, just helps in guiding them and making them go for it. Taking it further and relaying with the POTTER analogy . the clay and water belongs to you- the potter. The wheel belongs to you. There is a rough idea an image ( solution) that is buried within. As a facilitator or a coach, INTRADIA will work with you to ensure that the final tight pot is created. At no stage will we be giving a solution. Hence the result is really a set clear directional solutions that have emerged after complete open discussion/ debate as the Co-OWNED CO-CREATED SOLUTION. There is a collective ownership of the idea. PRE-WORKSHOP MANTHAN: In this we would interact with the stakeholder team members to fully understand and appreciate the issue. Time taken is really a function of the team size hence number of interaction and scheduling of these interactions. WORKSHOP- SANGHOSHTI: This is a 2 day-1 night workshop at an offsite venue. The relevant stakeholders must participate. The leadership which could take the call on possible roots act as clients. POST WORKSHOP- OWNERSHIP: This is an optional part. In case the organisation wants INTRADIA to followup on the identified solutions, we take such an assignment and acting as a part of the internal team do a strong monitoring. Intradia works with clients in RELATIONSHIP / RETAINER SHIP where Intradia acts as a internal consultant on time or project basis. t. WORKSHOP: On a given challenge. TRAINER. Traine a small team on the process.